Cell division is an essential process that comprises of several steps and dramatic movements of cellular components, most obviously chromosomes and microtubules. Of the many processes necessary to achieve faithful chromosome segregation in every cell cycle, the role of chromosome alignment has been one of the more difficult steps to dissect carefully. This requires experimentally perturbing chromosome alignment without affecting bioriented kinetochore attachments to spindle microtubules, which has been a challenging technical issue. 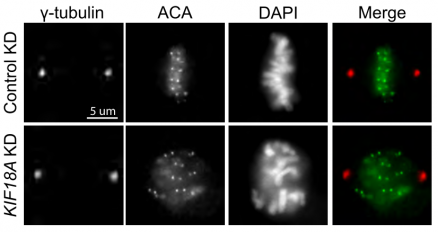 Here, Fonseca et al use imaging to investigate chromosome alignment in cells that lack the kinesin Kif18A, which has been shown to have independent and separable roles in mediating both chromosome alignment and attachment. Therefore, Kif18A-deficient cells can still attach correctly but will cause alignment defects. Fonseca et al find that proper alignment mediated by Kif18A is necessary for nuclear envelope formation in the resulting daughter cells. The authors firstly determined through siRNA treatment or CRISPR-Cas9 genomic editing that Kif18A-depleted hTERT-RPE1 cells have disrupted chromosome alignment as measured by the distribution of labeled kinetochores along the spindle axis. Importantly, this effect can be rescued by expressing Kif18A in deficient cells. Live cell imaging and chromosome fluorescent in situ hybridization also revealed that Kif18A-deficient cells can still complete cell division and segregate chromosomes faithfully without aneuploidy. These cells were compared to MAD2-deficient cells, which leads to segregation errors due to incorrect kinetochore-microtubule attachments. Kif18A siRNA-mediated knockdown in RPE1 cells results in misaligned chromosomes. From Figure 1. Interestingly, the authors observed that Kif18A loss leads to increased micronuclei formation in daughter cells. Overall, these cells showed nuclear defects where primary nuclei had disrupted shapes. These defects are mostly seen in daughter cells, rather than the mother cell. Live cell imaging revealed that Kif18A-deficient cells have lagging chromosomes that are excluded from the primary nucleus and form micronuclei. Despite moving at a normal speed and velocity towards the spindle poles, these chromosomes have a larger distance to travel during segregation. Thus, the lack of alignment from Kif18A loss leaves some chromosomes in a position where they are farther away from their end goal (the spindle poles), so they end up lagging behind during segregation and forming micronuclei. These micronucleated cells subsequently have reduced rates of division, which the authors suggest could be due to a p53-dependent mechanism. Lagging chromosomes form micronuclei after segregation. From Figure 6. Finally, the authors describe similar cellular phenotypes found in Kif18A mutant mice fibroblasts. In addition, homozygous mutant mice exhibit mortality, decreased body weight, and slowed growth, which suggests a key role for chromosome alignment in viability of organisms. This preprint follows a fundamental question that has not been well-addressed previously. There have been an overwhelming number of studies demonstrating the importance of proper kinetochore-microtubule attachments, and it’s great to see this group address these potentially interfering mechanisms in their results as well. This work brings together several aspects of the cell cycle as one cellular process, from metaphase plate alignment to nuclear envelope formation in the following interphase, rather than focusing solely on the mechanisms that may disrupt chromosome alignment. Their results from mutant mice also bolsters their observations and conclusions about the importance of proper alignment, although it is perhaps surprising that lack of alignment does not lead to more deleterious segregation or developmental defects. Resulting nuclear abnormalities after loss of chromosome alignment. From Figure 7. What are other proteins or mechanisms involved in mediating chromosome alignment but not microtubule attachment? How might they work together with Kif18A to promote proper alignment? Do micronucleated cells lose any chromosomes in additional rounds of cell division or after a certain period of time? Or are these chromosomes reincorporated into the primary nucleus after nuclear envelope breakdown? The in vivo phenotype in mutant mice was interesting in that lacking chromosome alignment is not entirely lethal. Are these mice predisposed to aneuploidy and thus predisposed to genomic instability or cancer? What are the consequences of having a Kif18A mutation in other aspects of development and organismal health up to adulthood or even the following generation?